Posted on January 17, 2019 at 11:11 am. Gambling operators are jostling for position as Japan prepares to issue licences for the country’s first integrated casino resorts (IR). 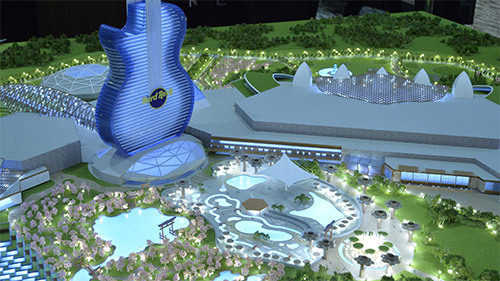 Hard Rock International is one of the many firms that has expressed interest in acquiring a Japanese casino licence. In a press release on January 11, the company revealed its plans for a casino resort in Tomakomai, Hokkaido. Included in the design is a guitar-shaped hotel tower, monorail access to the airport and an additional Four Seasons hotel. There is also a health and well-being center, a theatre, an entertainment venue and around 215,000 square feet of retail and dining space. Despite all the modern features, the resort aims to embrace the village culture of the Ainu – the indigenous people of Hokkaido. “We are extremely excited about the prospect of introducing our Hard Rock family to the people of Hokkaido, Japan with this world-class entertainment resort,” said Jim Allen, CEO of Hard Rock. Hard Rock has also announced partnership deals with the New York Yankees and Nederlander Worldwide Entertainment, the latter of which focuses on Broadway theatre experiences.